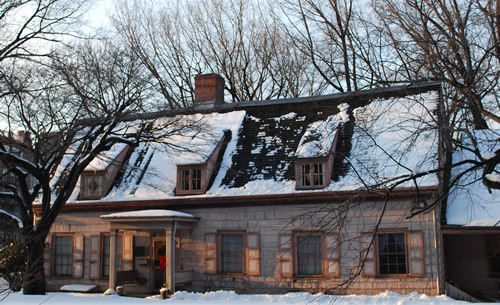 The John Bowne House, located in Flushing and owned by the New York City Department of Parks and Recreation, includes the section built in 1661 that hosted Quaker meetings. It is on the National Register of Historical Places and is one of the sites that Congresswoman Grace Meng is working to have supported by the National Park Service. Legislation sponsored by U.S. Representative Grace Meng (D-Queens) that seeks to make Queens historic sites part of the National Park Service has been signed into law by President Obama. The measure, which the President signed as part of a broader authorization bill, requires the Secretary of the Interior, whose agency administers federal parks, to study the viability of the National Park Service supporting spots associated with the Flushing Remonstrance, the document signed in 1657 that is recognized as the precursor of religious freedom in America. Properties that will be examined are the John Bowne House and the Old Quaker Meetinghouse, both in Flushing. The Park Service plans to use internal standards to determine whether the Bowne House and Quaker Meetinghouse meet the criteria to be included in the nation’s park system. The criteria will be based on the sites meeting national significance, suitability, and feasibility, as well as the need for National Park Service management. The study, which will cost between $200,00 and $300,000, could lead to the two locations becoming either National Historic Parks or National Historic Sites.